Advertiser.ie - Why did Robert Gregory reach for the sky? Major Robert Gregory MC, credited with nineteen aerial victories, died when his plane fell out of the sky over Monastiero, Padua, Italy, January 23 1918. It was the last year of a terrible war during which 18 million soldiers and civilians were killed, and an estimated 23 million wounded, ranking it among the deadliest conflict in history. In fact it is a surprise that Robert Gregory survived for so long. He joined the Connaught Rangers in September 1915, transferring shortly afterwards to the Royal Flying Corps. He proved to be an excellent pilot. On August 9 Gregory led 40 Squadron against hostile balloons, crossing German lines at ground level to avoid being seen by observers in the balloons. Then suddenly, climbing steeply, making a surprise attack from below. It was a stunning coup de main. That morning five enemy balloons were destroyed. As the balloonists jumped out and parachuted to the ground, the British planes were ordered to circle back, and shoot the parachutists with their revolvers. ** A bloody and ruthless business. Forty Squadron was a strongly Irish outfit. It included Mick Mannock from Cork, later to receive the Victoria Cross, George McElroy from Dublin also highly decorated, as were fellow pilots Keen, de Burgh, Mulholland all under Major Gregory’s command. The French military authorities, especially appreciative of a true chevalier of the air, and an honorary Parisian (in recognition of his time spent in Paris as an art student with his wife Margaret before the war ), awarded him membership of the Legion d’Honneur. The question is often asked why Robert joined the armed forces in the first place. 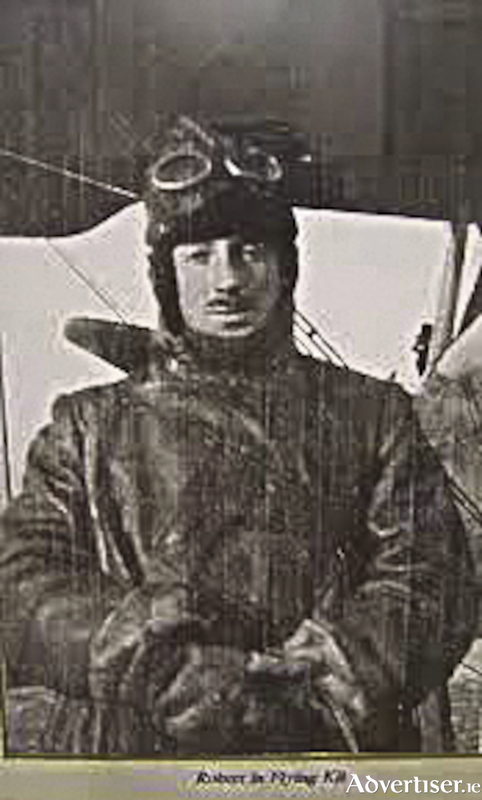 At 34 years old he was conspicuously older than his fellow pilots, most of whom were all in their 20s. Robert was Lady Gregory, and her late husband’s, only child. He was married to artist Margaret (nee Parry ), and father of three young children. He was heir to Coole Park house and its estate in south Galway. His mother undoubtedly could have used her influence, and got him settled in a safer command. But Robert chose the most dangerous front of the war, and the life of a pilot, where, by early 1917 Royal Flying Corps losses were 12 aircraft and 20 crew every day. In November 1917, as one of the most experienced pilots in the RFC, he was transferred to the Italian front. On January 23 1918, almost 100 years ago, Robert Gregory’s plane mysteriously fell from the sky. He is buried at Padua main cemetery. His wife Margaret kept a diary which remained in private hands for 90 years. It describes an explosive personal drama that took place during the spring and summer of 1915. It could reveal some of the circumstances that drove Robert into the sky. I will try to tell that story in the next few weeks. NOTES: *James Pethica, Theatre and English professor at William’s College, USA, and official biographer of Lady Gregory, quotes combat records and flight logs, where Gregory describes his actions in a very ‘laconic and self-effacing’ way. There is little detail of his bravery. ** Kevin Myers, Irish Times August 30 2002.